There are a couple of ways to follow us on our trip. I've tried to make the narrative a complete summary, but I've used links to other web sites to provide additional details and sometimes pictures. You can either stick with the basic narrative or explore the various links. At the time this album was created the links were all valid, but the WWW is in constant flux and that can change. If you encounter broken links, please send us some email. In 1984 the company I worked for, Tandem Computers, was experiencing some financial difficulties. As a result all the employees received the entire Thanksgiving week off (without pay). Jim and I pondered what to do and decided to go skiing. Tandem had an extensive email network so I sent out a query for the best places to get early skiing. The hands-down choice was Mt. Bachelor in Oregon. We had never heard of it, but decided to give it a go. It was a momentous choice. 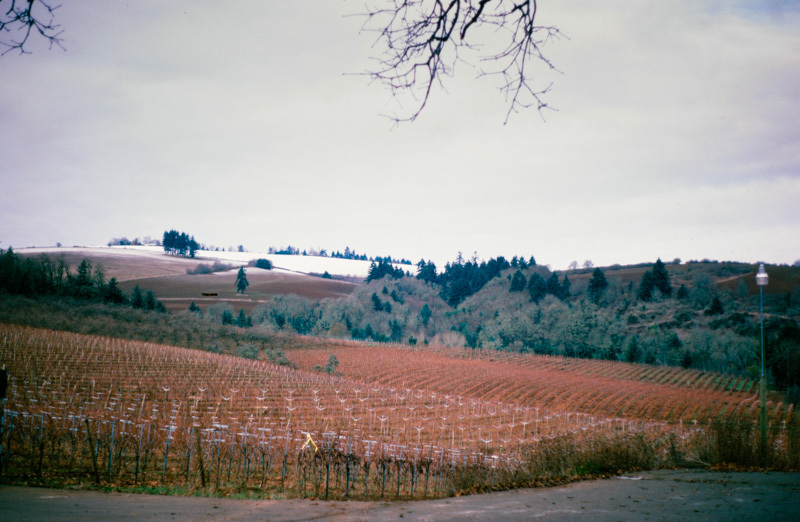 At this time Oregon wines were just coming into prominence, so we extended our plans to include half a week of skiing and half a week of wine tasting in the Willamette (that's pronounced wil-LAM-it) Valley. It was the first of many such visits to Oregon. 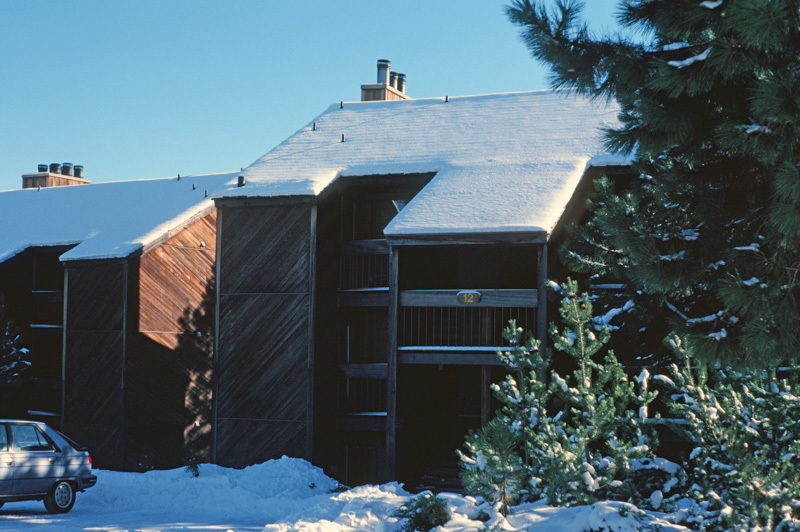 I no longer remember how we found out about Inn of the Seventh Mountain (as it was known then), but it was the place we stayed on all of our many visits to Bend. We even considered the option of buying a condo there. The name, as I recall, is based on the fact that Mt. Bachelor (technically "Bachelor Butte") is the 7th mountain over 9,000' south of somewhere or the other. The Oregon border? The U.S. border? I've forgotten. There is no ski-in-ski-out at Mt. Bachelor so we had to drive to the mountain every day. It was a beautiful drive, so it wasn't a hardship. 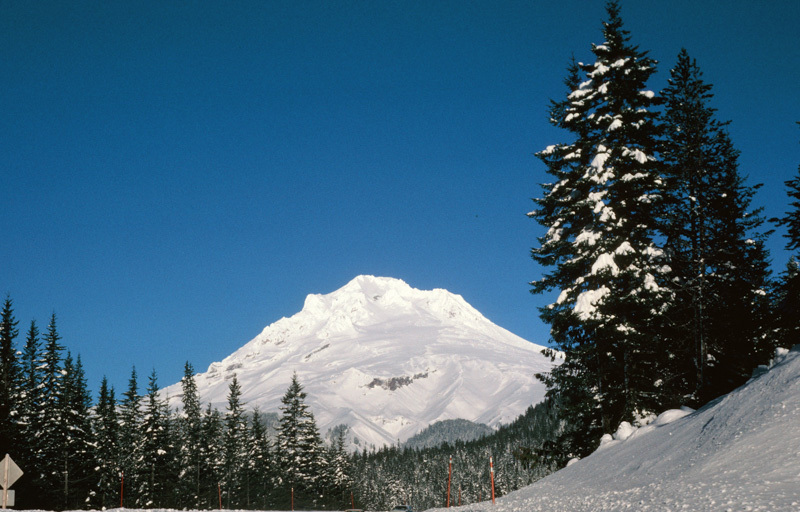 The mountain is a dormant volcano surrounded by other volcanoes. This was not long after Mt. St. Helens erupted, but none of mountains in this area were rumbling. 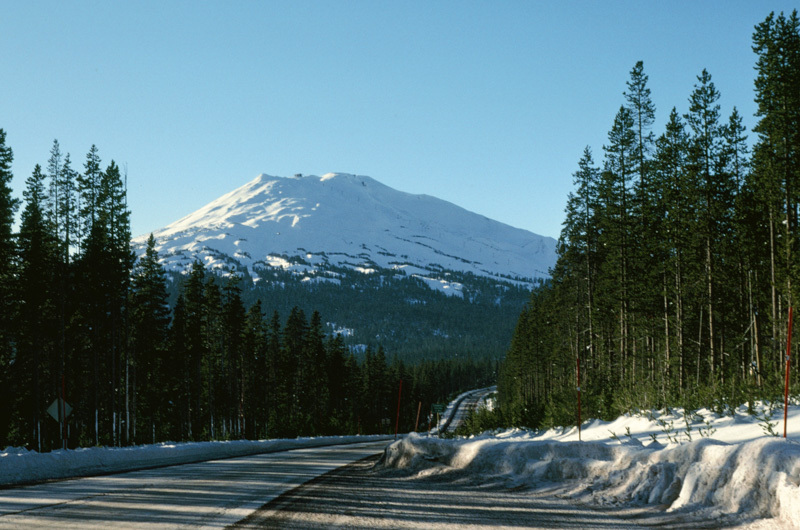 The area has varied terrain with lava fields, cinder cones, and lava tubes. Many of the attractions are closed in winter, however, because there is too much snow to maintain access. 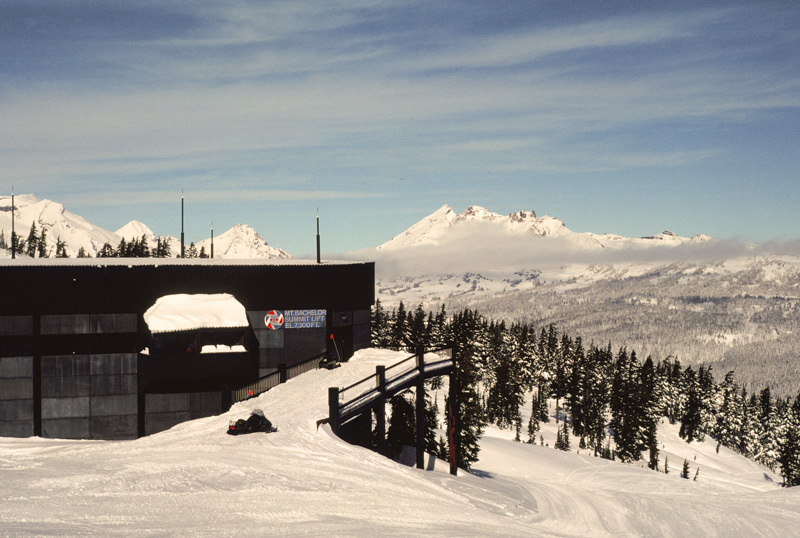 The ski runs cover almost 270° of the symmetrical mountain. 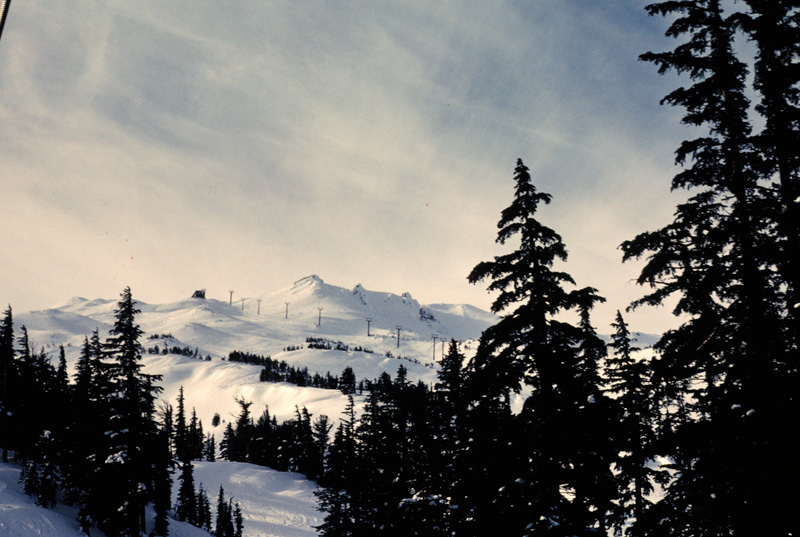 The peak is above the tree line and is often closed due to high winds. The layout enables skiers to follow the sun for the best conditions. 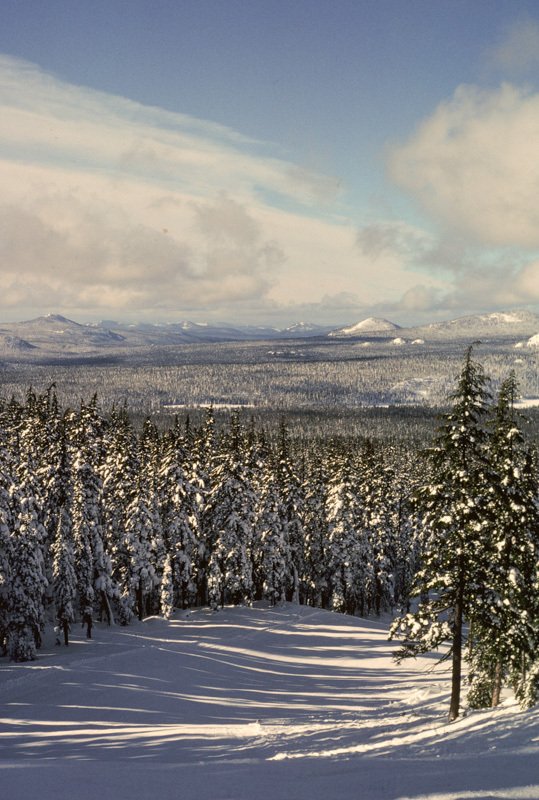 The view from the base of the Summit Lift looking toward Three-Fingered Jack. Even though it is only Thanksgiving week there is plenty of snow. We later found that this is not always the case, but we usually had good skiing. A view of the summit. It was not open during this visit. 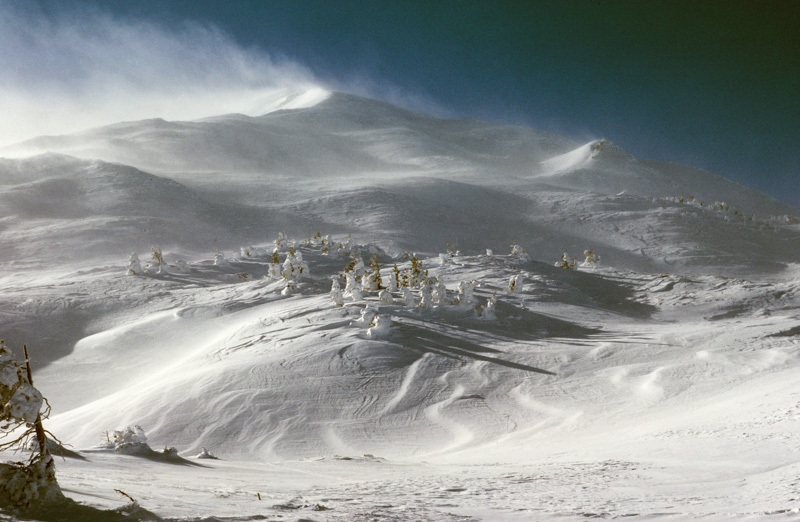 I think I was only able to ski the summit once in our trips and it was during a white-out! Most of the runs at Mt. Bachelor are wide-open cruisers. The first half of Thanksgiving week we pretty much have the mountain to ourselves. The crowds start moving in on Wednesday, but by then we were leaving. We tried for years to convince our ski club to run a trip to Mt. Bachelor, but since it wasn't ski-in-ski-out no one was interested. In 2015 the Blue Ridge Ski Council organized their Western Carnival there and several skiers from our club participated. The conditions were horrible that year and the weather was worse: pouring rain. Oh well. 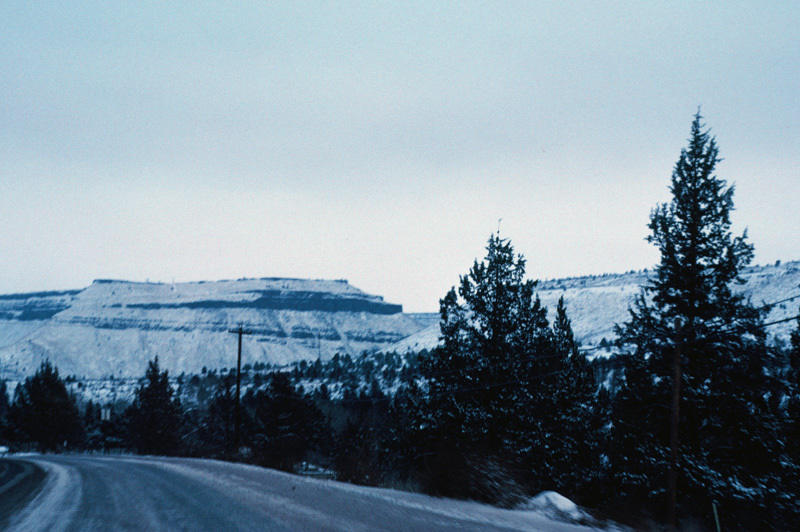 Another view of the mountain from the access road. The area has a lot of backwoods cross-country skiing as well. There are actually two locations where people stay when visiting Mt. Bachelor: Bend and Sun River. 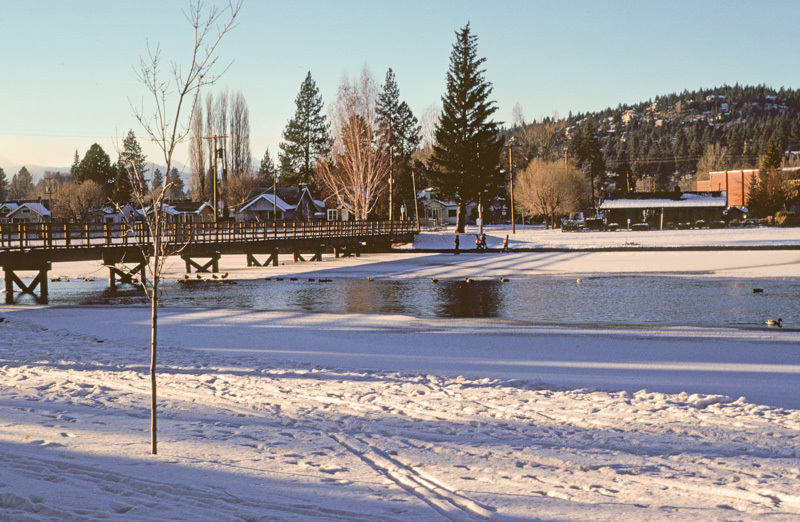 We drove down to Sun River once to visit, but we much prefer Bend. This is Drake Pond, very close to downtown. There are numerous resident ducks. 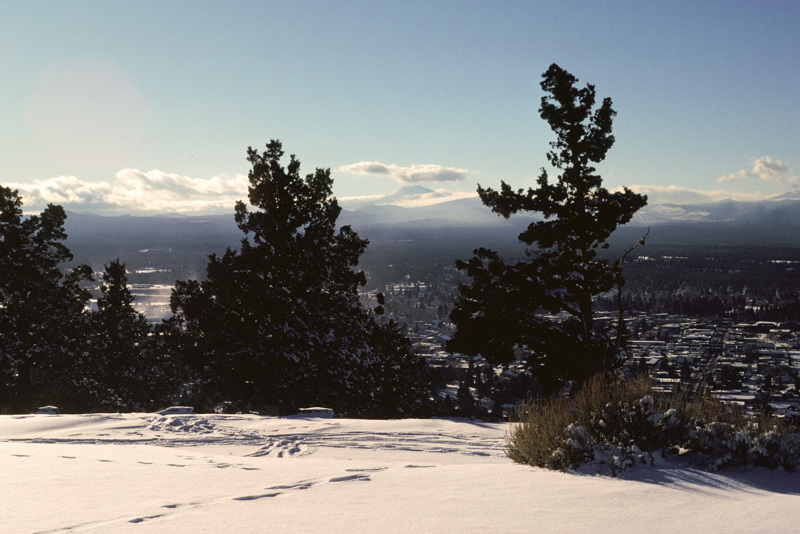 One of the notable features of Bend is a large cinder cone in the middle of town called Pilot Butte. The road up is closed in the winter, but it is a nice walk to the summit. You can see Mt. Bachelor in the distance. 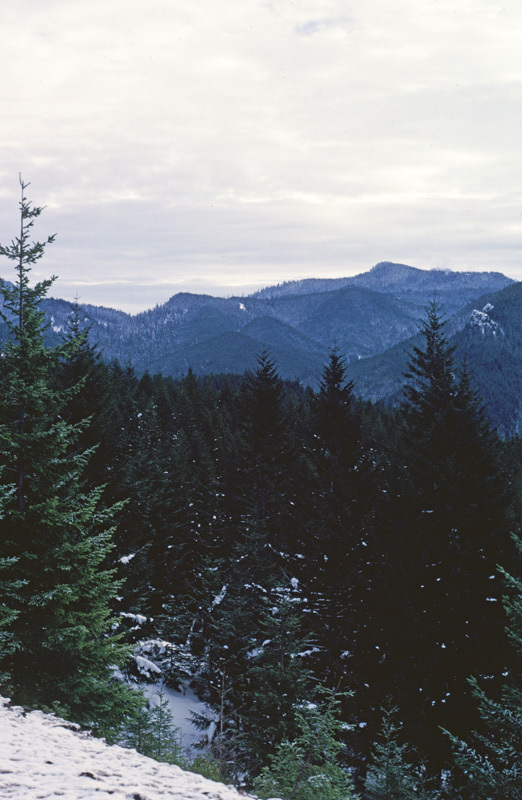 On Thanksgiving Day we checked out and headed over the Cascades for the second part of our adventure. The roads were snowy and when we checked the chains that came with our rental car we were dismayed to find that there was only one! Fine lot of help that would be. Forever afterward, we made it a point to check before driving away from the rental lot! The roads were not really a problem, however. Although the eastern slopes of the Cascades are dry and Bend is on the edge of the high desert, as we proceeded west we entered a region that gets A LOT of rain. 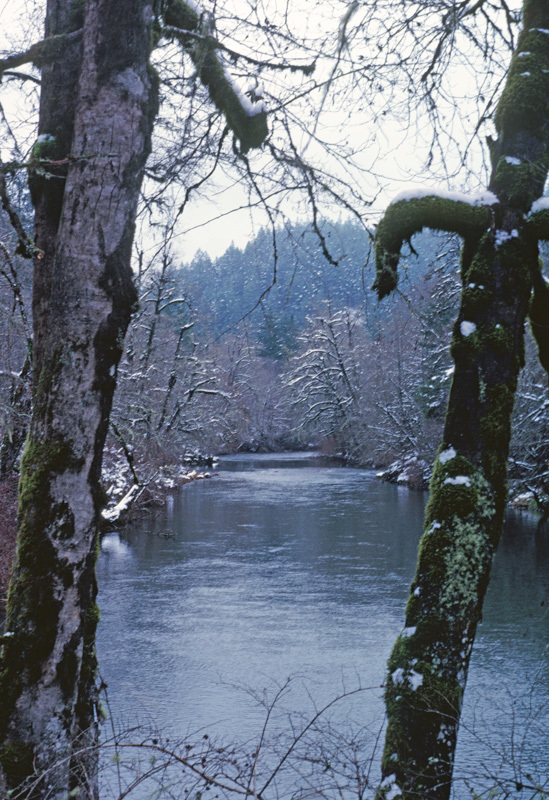 The trees were draped with moss and there were many rivers and streams. But it was Thanksgiving Day after all and we needed a traditional turkey dinner. 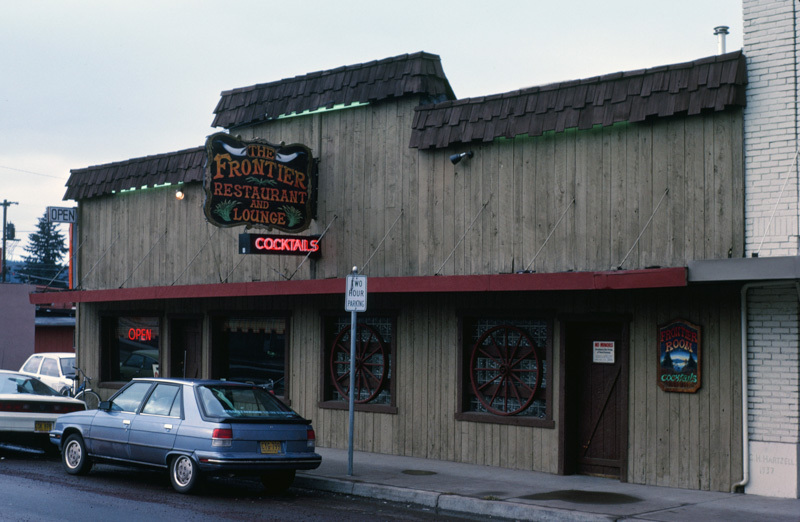 The Frontier Restaurant in Sweet Home served the best turkey meal I've ever had -- before or since. Unfortunately it is now closed. Sweet Home became a regular stop on these pilgrimages over the years. The rest of our trip was spent touring the Oregon wine country. Thanksgiving week, as it turns out, is their big blow-out week. All of the wineries have open house, even those that are normally closed to the public. We fell in love with Oregon and have made many return trips. Click your "back" button to return.